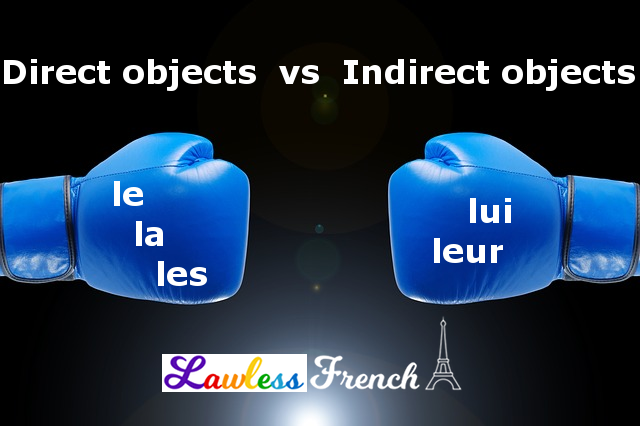 Direct objects and indirect objects can be tricky to understand and use, but it’s essential to know the difference in order to speak and write French correctly. Here are some tips to help you figure out which type of object you’re dealing with. When the object is a noun, it’s a question of whether there’s a preposition, and if so, which one? Je vois tes enfants. I see your children. Il fait le gâteau. He’s making the cake. … and can be replaced by a direct object pronoun. Je les vois. I see them. Il le fait. He’s making it. Je parle à tes enfants. I’m talking to your children. Il téléphone à son grand-père. He’s calling his grandfather. … and can be replaced by an indirect object pronoun. Je leur parle. I’m talking to them. Il lui téléphone. He’s calling him. Attention : When à is followed by an inanimate noun, it cannot be replaced by an object pronoun. The different types of pronouns it can be replaced by will be addressed in a future lesson. Il fait le gâteau pour Élise. He’s making the cake for Élise. Il lui fait le gâteau. He’s making the cake for her. Je leur achète des vêtements. I buy clothes for them. a) When pour means "on behalf of" an animate noun, the noun is replaced by a stressed pronoun. J’achète des titres pour mes clients. I buy stock on behalf of my clients. > J’achète des titres pour eux. > I buy stock on behalf of them. b) When pour is followed by an inanimate noun, it can only be replaced by a stressed pronoun or indefinite demonstrative pronoun. 4) Some other preposition precedes the noun = noun is object of the preposition and cannot be replaced by an object pronoun. This will be explained further in a future lesson. The question of prepositions can be really tricky, because they are often not the same in French and English. So it’s the French usage that dictates whether you’re dealing with a direct object or an indirect object in French. Nous écoutons nos mères. We listen to our mothers. Nous les écoutons. We listen to them. This goes the other way as well. Nous téléphonons à nos mères. We call our mothers. Nous leur téléphonons. We call them. When the object is already a pronoun, the task is even more complicated, because there’s no preposition to give you a hint. 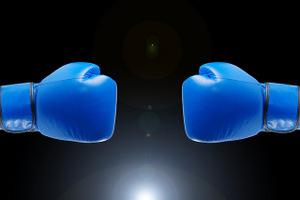 While third person pronouns have different forms depending on whether they’re direct (le, la, les) or indirect (lui, leur), first and second person direct and indirect pronouns are identical (me, nous, te, vous). So when you need to figure out which one you’re dealing with, you have to consider the verb in order to determine whether it requires a preposition, and if so, which one. Then return to the four scenarios at the beginning of this lesson. This set of lists can help: Verbs with prepositions.